It is a sobering fact of reality to appreciate that 95% of all pro-Israel supporters either in Britain or elsewhere who complain about Jeremy Corbyn’s concern for the Palestinian people, were not even born in 1947/8 when the Irgun and LEHI terrorists razed over 400 long-established Arab villages in Palestine and massacred many hundreds of their inhabitants including men, women and children. 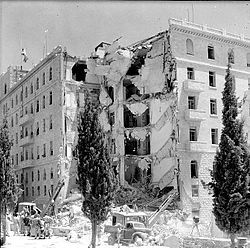 Most of today’s Zionists, whether Christian or Jewish, were not alive when the terrorists bombed the King David Hotel in Jerusalem containing the British Mandate HQ and killed 91 mainly civilians. It is also a sobering fact to realise that the Muslim Arab had been the majority demographic of Palestine continuously for at least 1200 years and that throughout all of that millennium, there was only ever a minority Jewish presence. These are documented facts in the public domain, not political propaganda, and easily verified in a few seconds by anyone with access to the internet, or a public library. It is also documented fact that there has been an army of occupation throughout former Palestine since 1967 and that there are now more than 600,000 illegal Israeli settlers on Palestinian land in the West Bank, East Jerusalem and also the Golan Heights, and that this illegal settlement has been declared to be in violation of international law and the Geneva Conventions on Human Rights and has been condemned by the United Nations Security Council in Resolution 2334. What further evidence is needed to show beyond doubt that Jeremy Corbyn is vindicated in his view that a continuing crime is being committed against the Palestinian people? The United Nations, (and its Security Council) is the only international body of recognised authority in the world to which over 195 nation states, including Israel, are members. It represents over 7 billion people worldwide. Yet the state of Israel is apparently allowed (by Donald Trump) to treat the UN Security Council Resolution 2334 with contempt. No wonder that Jeremy Corbyn is reluctant to be gagged by the CFI Israel Lobby at Westminster. Hans Stehling (pen name) is an analyst based in the UK. He is a frequent contributor to Global Research.